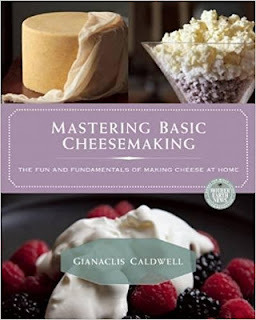 I found this book at the library the other week, Mastering Basic Cheesemaking by Gianaclis Caldwell. It was one of about half-a-dozen cheesemaking books that I checked out, and it's been an excellent read. Her approach is pretty much the opposite of David Asher's. Where he uses raw milk and natural ingredients, her ingredients and techniques are very modern. Makes for an interesting contrast, and I'm learning a lot by comparing the two books. One of the concepts she discusses in this book is terroir (tare WAH). Terroir is a French word often used in association with wine, beer, coffee, sourdough, etc., and cheese. It describes the uniqueness of foods based on their specific local factors: soil, weather, microclimate, growing and production techniques, microbial activity, and for cheese, even the kind of animal the milk came from along with its diet. Terroir describes the specialty of the place in which the food was grown and created. It is the reason some people are connoisseurs, because they appreciate the multiple international nuances of the foods they love. Terroir also explains why we home cheesemakers can never truly replicate the cheeses in the recipes we follow. My Cheddar will never taste like it was made in Somerset, England, nor can I ever make a mozzarella that tastes like those from the Italian Mediterranean. At best I can follow the recipes and hope I'm happy with the results. Now, if I were someone trying to master all the basic kinds of cheese, the concept of terroir might be discouraging, because I can never authentically replicate any kind of of cheese. In reality, I find it quite freeing; as long a cheese turns out well, then it isn't wrong, even if it nowhere resembles the cheese in the recipe I'm following. On another level, terroir is important to something that I've pondered for a number of years now - that of homestead cuisine. Most of us know that cuisine (another word from the French) refers to a particular style of cooking influenced by local foods and cooking techniques. We all have our favorites: Mexican and Cajun are a couple of mine. When I planned my first garden on our homestead, I thought of all the things we loved to eat. I thought I would grow everything we needed to continue loving those foods. But the reality of it is that not all plants grow well here. My climate and soil means it takes a lot more work to grow some things than others. If all I had to do was the garden, then I might be able to do just that. But as a homesteader working toward self-reliance, my time and energy are spread out over many things. To truly work smarter not harder, I must stick with things that grow well here with the least inputs from me. In terms of homestead sustainability, this means learning to work with what I've got. It means that Dan's and my diet will be more limited than the modern diet, also more seasonal, and definitely about as local as one can get. The challenge for me, then, is to work toward variety through creativity; in other words, learn to develop my own homestead cuisine. This is definitely a project in progress, but probably one of the most rewarding I've ever taken on. Because nothing is more satisfying that sitting down to a meal that is 80, 90, or 100% homegrown. I've not read about that particular topic but I was aware of it as I used to make my own sourdough by sitting it out on the picnic table outside with cheesecloth to gather the 'local' air born yeast. I'm getting ready to start that up again. Also, I always buy local honey as I've heard it helps with allergies if you ingest honey produced from local bees. Another fascinating topic, Leigh! As always, thank you! What a great post! I'm not (yet) into cheesemaking, but your words about homestead cuisine are causing me to ponder, and it's SUCH a good idea to simply ask, "What foods grow easily in my area?" That's a rather revolutionizing concept! I need to stop forcing my garden to try to grow perfect, huge tomatoes. One asset we have here is a 100 year old woman in our church who grew up in this county from birth, daughter of a tenant farmer. When I think of what they grew lots of (sweet potatoes and collards, and they ate a lot of cornbread), it makes me ponder if these are the foods "indigenous" to our county, to our soil, and perhaps we need to focus on them. Thanks for this idea! There is another book on the art of cheesemaking in which you do not have to buy cultures to make (you use kefir). I haven't made cheese since we re-homed our dairy goats. I don't miss the work, but I do miss the milk, butter, and cheese we got. I hope to be back to doing this again. Great post. M.K., I don't think this idea is something we take with us to homesteading. For me, it was a huge wake-up call to realize how much work growing certain foods would be, and how I didn't have time to do it all. Having that lady as a resource is wonderful! Pick her brain! Write down recipes! Some of the foods that are a big part of my homestead cuisine are okra, collards, corn, sweet potatoes, cowpeas, squash, and tomatoes which require a little pampering (but worth it!) Wheat grows well for us, and of course there are eggs, milk, and meat. Winter gives us plenty of greens and salads. It's been a wonderful journey of discovery. I've never heard that about local honey and allergies but it makes sense to me and perhaps explains why I never suffered from allergies and neither do my children. I refuse to buy or consume any honey that isn't local. and I used to try to get any herb variety I could lay my hands on, very proud when my mandrake set flowers and seeds! but what a job it was to keep it alive! I eventually realized that there's no point in pampering plants that have barely any practical use for the average person - other than showing off to one or two impressed neighbours:) I stopped paying extra attention to those plants and most died - but not all of them! now I only grow plants that are useful to me. just being pretty or rare doesn't do it - and my gardening work has gone down quite a bit! I think those of us who grew up on farm and eating from our gardens know what you're talking about. If we didn't grow it (or someone near us) we didn't eat it. Canning and freezing were the methods to store foods year round. Creativity was required to keep from having a boring diet. Also, there are foods that would have grown quite well in north Florida but they were not part of the traditional foodstuffs known to my parents and, thus, were not included. Farmers have long known that the diet of animals plays a large part in the flavor of the meat. And, if you've ever had the exquisite experience of tasting milk from a cow that had gotten into what we called bitter weeds, you know very well that diet influences taste!!! In this case, in a very nasty way. That milk got thrown out pronto. Homestead cuisine. Love that term! Eating seasonally is something we strive for, more each year. In season, meals of only a big tossed salad (often minutes from the garden) or bowls of fresh berries day after day are the norm around here. And, of course, we go through our "seasonal" winter eating of food from the cellar or that put by from the pantry. In our early years here in northern MN, there were still many of the "old folks" who had been born and raised here. One dear lady was a wealth of stories and information. Those early (large!) families ate A LOT of root crops because they grow so well in the area. All the early homesteading families had a cow and not one iota of product from either garden or animal was wasted. Venison was plentiful for another source of meat. They lacked fresh fruit and most anything else "fresh" in the winter months, but survived doing hard work each day and didn't feel deprived. In this day and age with all our gardening and animal husbandry aides, we should be able to develop a very desirable homestead cuisine. Thanks for bringing this concept to the forefront, Leigh. I would argue that your diet is far LESS limited than the modern diet, at least the modern diet of the majority of Americans. Most people start with packaged goods, not from scratch, and worse yet, many rely heavily on fast-food establishments for at least one meal a day. Your variety of fruits, vegetables, animal products, and herbs surpass that in most American diets! I thought terroir was a play on terror... what a rube I am. Eating your own food IS better than store bought - that, I understood completely. Bettina, kids around the world must all think the same, LOL. Very good point about how much easier gardening becomes when we stop trying to pamper "exotics." I know some people will still enjoy that as a hobby, but for practical purposes it's best to stick with what wants to grow there. Sue, creativity is key! I agree. 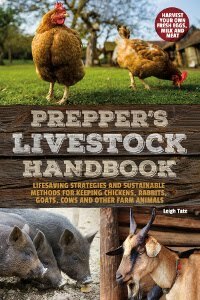 It's important for folks trying to be food self-reliant, and also preppers who eat out of their food storage. I think too, the seasons add variety with the things we only get once a year. Mama Pea, how interesting that you had so many native neighbors. Those are the folks to learn from! Our modern diet wastes so much in terms of what is discarded for the parts we're accustomed to eating. That was a learning process for us too, though. Mrs. Shoes, LOL. I do that with words as well - sometimes my mind thinks a word is something other than what it really is. Terr is French for earth, so it's an interesting concept, isn't it? The moral of the story is that we should all be proud of our various regional distinctions when it comes to food. I agree with you Leigh. I think that's why certain wines appeal to me more than others. I've done extensive reading on terroirs, here in our area, it's very big with the apple industry. Not the apples themselves, but the apple ciders, apple brandies and apple liqueurs. I have her book. That is what got me interested in cheese making to begin with. When I read her book, I found her website and that's where she posted her traditional Mozza recipe that worked for me. She's very nice, when I had questions, I asked her on Facebook and she replied pretty quickly. She told me that most books won't say it, but that the recipes written are assuming you use raw milk, which makes things difficult for us people who have to buy pasteurized from the grocery store. But she gave me lots of tips. I really want to support her. I have her other cheese making book "Mastering Artisan Cheese Making" on my wish list too. I like your take on homestead cuisine. I'm trying my best to make the things we love to eat the most. But you're so right, I really can't grow a lot of the produce that we love in our foods...so we adapt right? Nice post Leigh! Rain, I think Gianaclis's book is the best beginner book out there. Ricki Carroll's seems to be the one most folks start with, and it's a good book. I just like Gianaclis's better. I would definitely recommend this for any beginning cheesemaker. I won't actually try any of her recipes, because I don't have any commercial starters. So I'm following David Asher's recipes and then comparing the steps to hers. They are similar, but the differences are interesting. I think each of us seeking self-reliance has to find our own way in terms of what we can grow and how we eat it. There are a few things I hang in there with (my Meyers lemon, even if I only get one lemon cream pie per year, and my ginger). But for the most part, I'm enjoying experimenting with what I've got and working out numerous ways to eat them. So far it's been a fun journey! 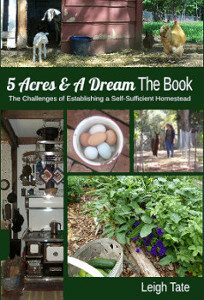 It was an interesting experience, entering the homesteading life in middle age. I have always been interested in food/cuisine. When I traveled, in my past life, I would seek out local places to eat local food. It was an eye-opener! So many more flavors, textures, colors! Once I got my cow and tasted raw milk, I never looked back. Same with raising chickens for eggs. It's not that difficult - for me with no kids - to eat seasonal foods. I just kept cutting out all the 'fluff' as I ventured more deeply into self-sustainability. What has helped me adapt is your blog - all the research and thought you've put into every imaginable subject over the years and have been gracious enough to share it. You are a precious resource! Susan, your saying that just made my day. Thank you! You've posted quite a bit about your own journey into food self-sufficiency, and I have to say that your posts are always an inspiration. Donna, that's always the hazard! I know that for awhile I got so sick of eating eggs, eggs, eggs, that I finally went out and bought some tuna fish for lunch! You're right that it's a good lesson though, and we've come to the same conclusion, better planning both in growing and preserving. That's assuming the weather and critters all cooperate!